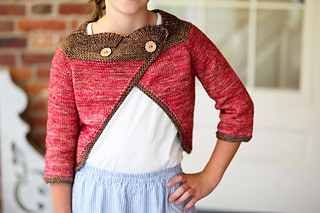 This sweet Child’s shrug is worked from the top down, beginning with the collar. 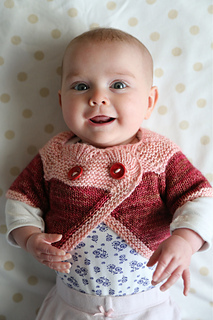 Short rows are worked to shape the neckline; the short sleeves and body are worked in the round. The edging is picked up and worked in one piece. This pattern calls for approx 125 (150, 175, 200, 210, 222, 240) yards of The Uncommon Thread Merino dk plus approx 60 (70, 75, 80, 90, 100, 110, 120) yards in a contrasting colour. Ice Cream Sundae was initially offered exclusively as part of a kit sold in The Uncommon Thread’s website.